Licensed Electrician | Electrical Contractor | Thomson, Ga. - Walden Electric | Thomson, Lincolnton, Washington, Ga. Licensed Electrician | Electrical Contractor | Thomson, Ga. Licensed, Bonded, and Insured Electrical Contractor in Thomson, Ga.
Walden Electric is a full service, licensed electrical contractor located in Thomson, Georgia. We are experts in all areas of residential and commercial electrical systems. We are a family owned and family operated business that has been serving Thomson and surrounding communities since 1999. Our electricians are well trained, experienced, and have flawlessly performed projects that range from million dollar commercial jobs to small residential service work. Our aerial services division includes bucket truck and other equipment to provide installation and repairs to parking lot lighting, signs, etc. We serve McDuffie, Lincoln, Wilkes, Warren, Columbia, and Richmond Counties in Georgia. 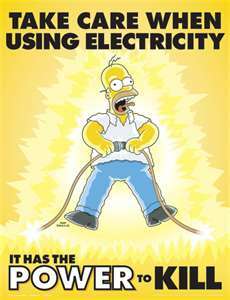 Remember to be safe around electricity and ALWAYS use a LICENSED electrical contractor to perform all of your electrical projects. Is the safety and well being of your family or employees really worth hiring someone that has not been properly trained? What about someone that does not have appropriate experience? Remember you are jeopardizing their safety and yours by not using a licensed professional, and it typically costs the consumer more money in the end to have a professional come out and correct the problems caused by these people that are not qualified. Thomson, Dearing, Lincolnton, Washington, Warrenton, Norwood, Camak, Harlem, Appling, Grovetown, Evans, Martinez, and Augusta.